I threw up these twelve blocks a week ago just to have something different to look at. I’m not sure what I’m going to do with them yet. 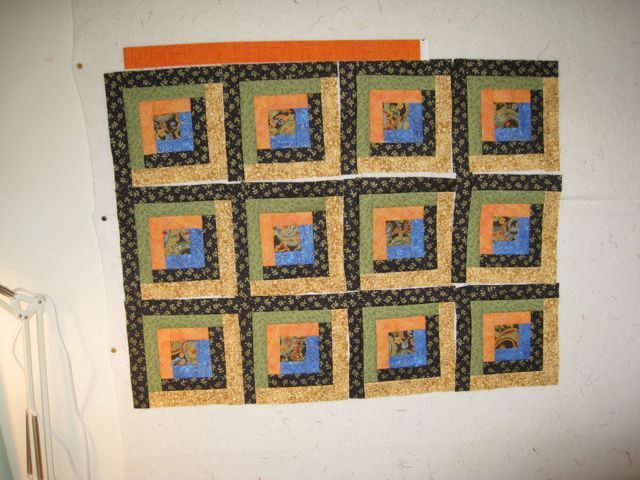 Maybe incorporate them into a quilt with some Halloween blocks from swap we did a few years ago. See what having them on the wall resulted in? I wouldn’t have thought of that if I hadn’t been staring at them mindlessly this past weekend. So this past weekend I got to pay with my new Viking Sapphire 850. I absolutely love this machine and I got a fantastic deal on it. Saturday I quilted borders on both my Old Tobacco Road and my Orange Crush, finally! Not finished yet, but they are well on their way. What a difference a good machine with a 10″ throat makes. 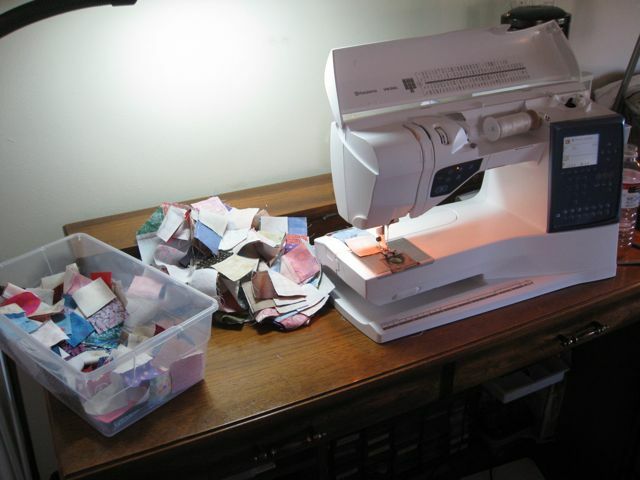 And, that pile of four patches in the picture is growing like crazy. I’m making those for Part 1 of Bonnie’s Christmas Lights mystery just published in Quiltmaker magazine, July/August issue. I subscribed to Quiltmaker earlier this year because Bonnie told us this mystery was coming. I had a bin full of 2″ strips of all different lengths so I just started sewing lights to darks until I got tired, then cut them into two inches pieces until I got tired of that, and then sewed them together randomly to make 4 patches. I have way more 4 patches than I will need for this quilt (52), but Bonnie’s quilts always seem to use scrappy 4 patches so they won’t go to waste. I was experimenting with the 1/4″ quilting foot that I got for the Sapphire versus the 1/4″ stitch setting on the machine using the regular A foot. The 1/4″ foot makes a really generous quarter inch seam so that’s no good and you can’t move the needle over because the hole is very small. I’m just wondering if I can make that hole bigger because I love the edge on the foot for butting the fabric against. Since the foot is plastic, I’m thinking there’s got to be a way to enlarge the hole so I can move the needle over to the right a bit to get a scant 1/4″ seam. Otherwise, I’m totally happy with the 1/4″ stitch built into the machine. What is does is move the needle over to the right just enough so that if you line up the edge of the fabric with the right edge of the foot, you get a perfect scant 1/4″ seam. So that’s what I used to make all these 4 patches. This machine is just amazing with it’s 10″ bed, needle down and foot up to pivot position. I did a cable border on the outside border of OTR without having to constantly lift the foot to pivot on the curve. And, it sews beautifully. I can’t say enough about it so far. You hit on my complaint with most 1/4″ feet – the small needle opening. And the fact that all of them I have owned measured out an actual 1/4″ seam, not the scant 1/4″ needed for accurate piecing to accomodate the thickness of the fabric pressed to the side at the seam.